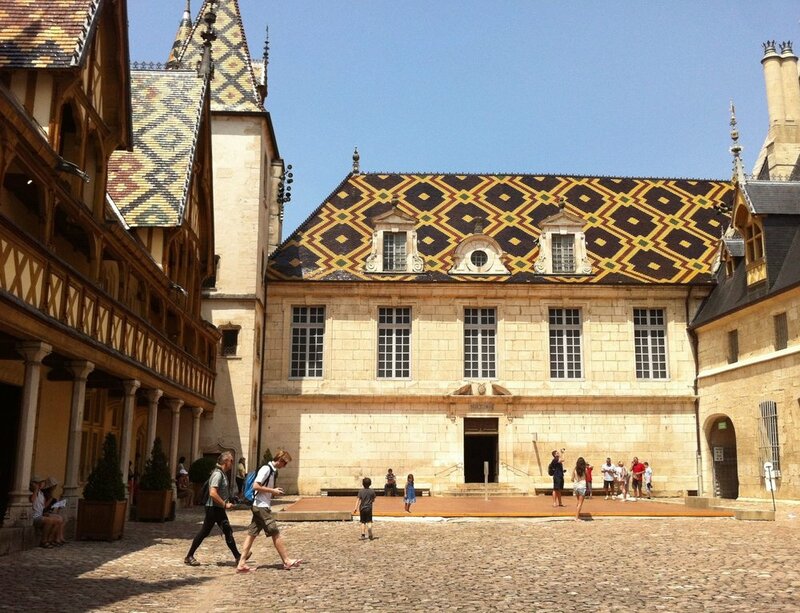 Above is a shot of of the roof on the Hospices de Beaune. Our brother-in-law works there so we can always get in quickly, especially once everyone else has left for the day. It is pretty much a not-to-be-missed spot when visiting Beaune. The stunning courtyard set off by the bright, patterned traditional Burgundian roof tiles never fails to amaze. Of course with Clémentine we always have to stop to do a minimum of three rides on the manège on the Place Carnot that has been there since my first year in Burgundy in 1990-91 and probably long before that. After the merry-go-round we headed to the market for a bit. I snapped this photo of Clémentine following a local nun as though hypnotized. She was thrilled to see a "real, live nun" and we had to stalk the bonne soeur until Clémentine watched her buy a baguette and a bag of nougats. I've always liked this photo taken of the reflection of the market action in the window of Beaune's oldest (and one of its most picturesque) wine stores. I adore the little red storefront of "Sensation Vin", right near the Nôtre-Dame basilica. We recommend this spot to our guests at our Burgundy vacation rentals for a good introduction to the local winetasting scene - they offer a wide variety of courses in varying lengths and depths. Then Franck snapped this photo of the window of a classic Beaune restaurant on the Place Carnot - you'll see this "wine by the glass" phrase A LOT in Beaune. This is the fabulous boulangerie on the Place Docteur Jorrot (best pain aux raisins in Beaune according to Franck) just steps from the door of our 18 Century rental apartment - Le Relais du Vieux Beaune - in the heart of medieval Beaune. Right beside it is most conveniently yet another wine store. Last but not least I stumbled upon these gorgeous old cars as I walked up the street from the boulangerie. In this town, you never know what beaune chose is going to reveal itself around the next (cobblestoned) corner. If you liked this, you’ll love my bestselling Grape Series, set in and around Beaune - available in both paperback and digital.